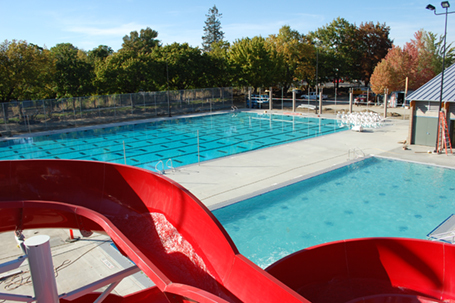 In 2007, the City of Spokane, Washington, retained the team of Counsilman-Hunsaker and ALSC Architects to prepare construction documents for the replacement of the 70-year-old Witter 50-meter pool. The result is a new modern deck-level gutter pool (home to the Spokane City Swim Team) capable of hosting the state’s northwestern area summer swim leagues. The major challenge at this site (adjacent to a tributary of the Spokane River) was to determine the exact orientation of the new pool and the positioning of the new bathhouse to accommodate an anticipated high volume of visitors. Improvements to parking and pedestrian travel were two of the key focus points for city staff while the neighborhood groups were concerned about the swim team’s downtime. Numerous neighborhood meetings took place and the design solution included the reuse of the existing building to accommodate the pool mechanical systems, which enabled more funds to be applied to additional water areas, including a recreation pool for swim lessons and children’s water fun.